After photographing the moss covered trees in the Hoh Rainforest, Kimberly and I headed to the coastal area of Olympic National Park. I was hoping to photograph a sunset in the Pacific Ocean. However, the weather didn't seem to be very corporative when we arrived to the coast. It was misty. 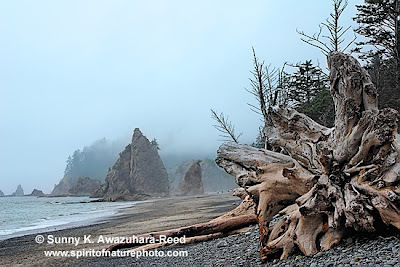 The Pacific Northwest Coast was very different from the Southern Californian Coast where I live; so many washed out logs were piled up on the beach, huge rocks are sticking up where the waves crash, and some trees were growing on those rocks! I know there is scenery like that in the north coast of Japan, but not in Southern California. The scenery was mysteriously beautiful with a misty rain. 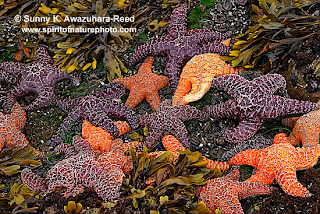 There were tide pools around the rock tower; full of starfish and other sea life in the area. I was amazed that the beach was well protected from development. The wilderness beaches went on for miles and miles. Kimberly used to backpack along this coastline for 3 days before. I was seeing several backpackers at the day. Deep woods were growing right by the beach. A whole area was covered up the fog, which I found very photogenic. Olympic National Park is very diverse. We also visited another beach and alpine ridge, drove by a large glacial lake, Puget Sounds and more. I could spend a month or more for photographing this rich natural area. After backpacking at Seven Lakes Basin, we drove to the famous moss covered rain forest "Hoh" area. 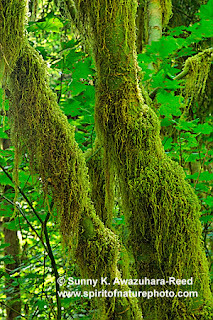 Driving in to the Hoh was amazing... the road was cut through deep woods - tall tree tunnels all covered with green moss drapes. Two short hiking loops started from the visitor center. We were walking into deep mossy woods; Hall of Mosses and Spruce Nature Trail. The forest floor was carpeted with fresh green ferns and mosses - so many different shades of greens! When the light broke through the clouds, it created a fantasy world! I just loved being there. We stayed in the campground in the area. I returned to these loops 2 more times. Great wildlife viewing in the campground, too. 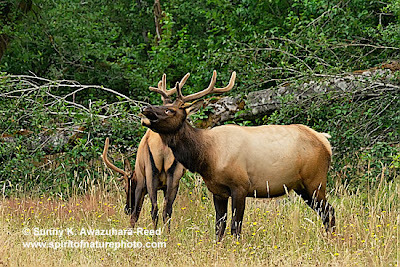 Two huge bull elks feeding at a site when we drove in. Several deer families (mother and baby) walked through the campground. How lucky I was seeing all of those in a short period of the time. Next Day, we headed to the Olympic Coast. 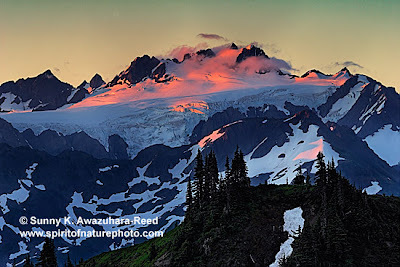 In early August, about a month after Alaska, I had another photography trip to Olympic National Park, Washington. 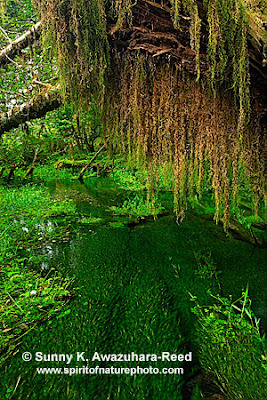 I always wanted to photograph the mossy forests in the Pacific Northwest, and my good friend Kimberly lives there, so why don't I visit there? I jumped on a train from San Diego to Tacoma, took about 40 hours one way. That was a pre-adventure! I was excited about having adventures with Kimberly; she is a very active outdoor girl, who used to be my co-worker in Alaska. 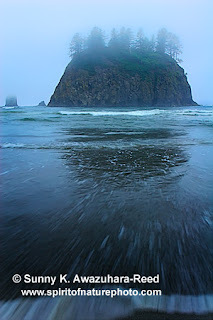 Olympic NP is a large diverse park located on the Olympic Peninsula right below the Canadian border. In the large park, there are 3 distinct regions; the Pacific Coastline, the glacial-capped peaks, and moss covered rain forest. 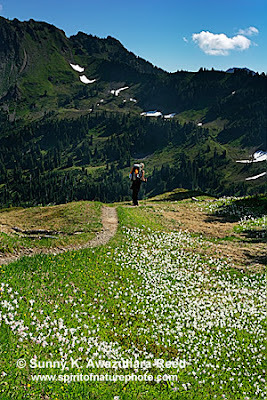 In early August, wildflowers carpeted all the alpine meadows. Our adventures began with the mountain part: 18 miles loop of backpacking in Seven Lakes Basin. The trail started from the beautiful mossy rain forest. 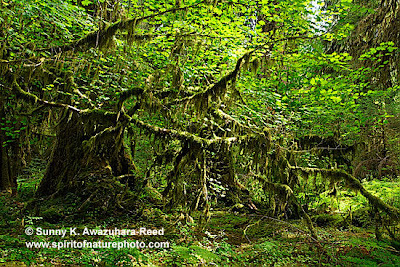 The mosses draped down from tall trees, ferns carpeted the floor, and streams ran among mossy rocks... very green! I instantly loved the scenery. The trail slowly climbed up through the woods, and contained through sub-alpine area with small lakes. When I climbed up to the ridge, there were wildflower gardens! 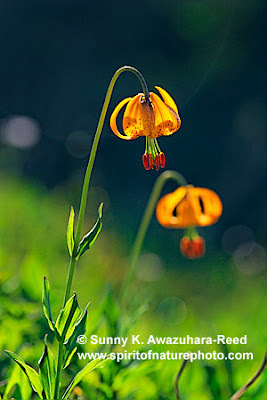 Yellow, orange, pink, violet, white.., I especially loved the patches of white lilies. 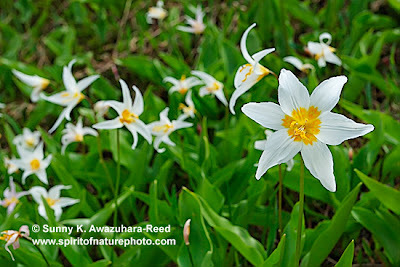 (Avalanche lily) The rugged peaks rose om my right. There are so many places I loved to photograph! We hiked up for a while, maybe 7 or 8 miles all up hill; it was time to find a camp site. The trail kept going on the ridge; it was hard to find an ideal flat area. Anyhow, we found a site and set up our camp. One thing I didn't like was that there was a pile of bear poop at the area. There wasn't any other options at the ridge, so we stayed there anyway. We tried to cook dinner, but the cooking stove fuel that Kimberly brought was broken... the liquid fuel kept leaking out... so, we could only eat dry food. Clouds moved over the ridge before sunset; the ridge was surrounded in thick fog. This meant there wasn't any sunset photo opportunities. Luckily, the next morning was beautiful, the sky was clear! The first sunlight lit the peak of Mt. Olympus and turned its glacier to pink. Even the steam from the snow was pink. Before we left camp, we tried to pump water from snow melt. After we filled one bottle, Kimberly's water filter broke! what was happening!? It wasn't a hot day, so we weren't going to need as much water. We had a wonderful view for the all-morning walk along the ridge; Mt. Olympus was on the right, Seven Lakes Basin was on the left, and colorful flowers were everywhere. I was happily walking the trail. On top of these views, 2 marmots were on the rock near trail!! What a bonus! One of them were posed for me. The trail went down slowly but it was long... we began seeing several hikers coming up. 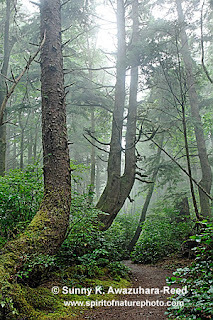 We hiked down through the sub-alpine area and into deep mossy woods again. It was nice and shady. I began feeling tired a bit. we hiked through the woods for a while and crossed a "scary" foot bridge; at that point my body began aching. I was shocked finding out there was still a 5 mile long stretch left. There wasn't any short cut, I had to hike back. Kimberly seemed to still be energetic, but I was being a walking machine without thinking. My backpack got heavier than ever. She helped carry my tripod, which was nice. I needed to take breaks every mile or so... After the long 5 miles, we finally reached the trail head. It was challenging, but the dramatic scenery was worth traveling 18 miles with pack. 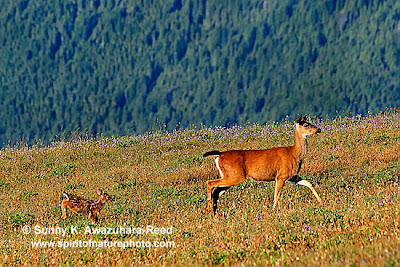 More Olympic NP photos are coming soon! After photographing bears along the Katmai Coast, my next destination was Denali National Park, located in the interior of Alaska. 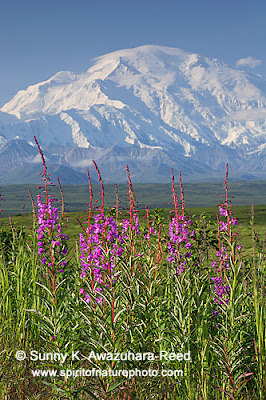 Denali NP is famous for the highest peak in North America - Mount McKinley ("Denali" in the native language), and its abundance of wildlife: grizzly, caribou, moose, Dall's sheep, lynx and many small animals. After 6 years, I was back in Denali again. During the summer of 2001, I worked at a hotel at the entrance area of the park. Since then, I have been in love with Alaskan wilderness. My main purpose for going back to Denali was photographing Mt. McKinley and its reflection on Wonder Lake during sunset and sunrise time with "magic purple light." So we stayed at the deep end of the Parkroad at Wonder Lake Campground. A huge cow moose greeted us before getting on the camper shuttle bus by the Visitor Center. Everyone grabbed cameras! She likes to hang out in the area because the predators will most likely stay away from busy tourist areas. Since she came too close to people, the park management put a collar on her in order to track her. It was lightly raining when we got on the shuttle. I was hoping it would clear up later. The mountain was hiding behind the clouds most of the time; only 1/3 of visitor ever get to see part of the mountain during their trip! Only lucky visitors ever seen a whole mountain. The French photographers in Katmai told us that they couldn't see the mountain at all for 3 days. Unlike my expectations, I didn't see so much wildlife from the bus on the way. I only saw several white dots (supposed to be Dall's sheep) and a few gray dots supposed to be caribou. 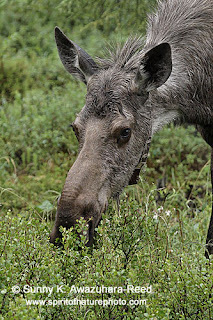 and one more, a moose far behind of bushes. Where were the bears? At that point, my closest wildlife sighting was the collared moose at the Visitor Center. After a quiet 6 hours, the shuttle arrived to Mile 85, Wonder Lake Campground. The rain stopped, but the mountain was far behind heavy clouds. The campground was luxurious for that remote wilderness area. We picked a nice site where there is supposed to be a Mt. McKinley view. There was a food cache house with covered cooking/ eating area nearby, and flush toilets and running water. The whole area was an open view with alpine tundra - vivid green! 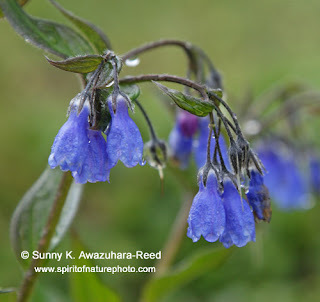 It was also peak season for the wildflowers blooming! Only problem was mosquitoes... a lot! There were crowds of them following whenever I go. We had to wear head nets! Although it was overcast, the sun didn't set until 2 a.m or so, and without getting real dark, the sun rose again a few hours later. Denali NP is located in the far north. Next morning, the mountain only showed its middle part - a long strip line between the clouds - then, it hid behind of the clouds again, all day. The clouds got lighter at night, I was hoping it would clear up in the middle of the night, so I set the alarm clock every one hour and checked if the mountain was showing up. It would be my last opportunity to photograph the mountain with purple light. I periodically checked outside every one hour until 5 a.m when finally the bottom part of the mountain was visible. Around 6 a.m, most of the mountain was shown up! It had already passed the magic hour time, but I was very excited to see the entire mountain. The sky cleared up while we were having breakfast. 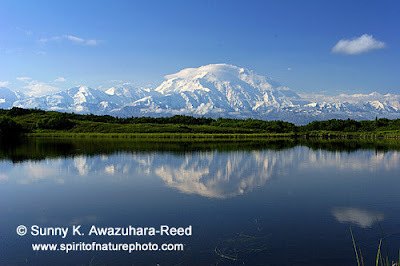 I photographed the mountain and reflection on the pond. However, when I was rush walking to the point where I can look down Wonder Lake, small clouds forming around the mountain. The clouds grew so fast! when I finally got to the hill, most of the mountain was hidden behind clouds even though other parts of the sky were still clear! I was glad to see the entire mountain for a while. We packed our camp down, and rode an afternoon shuttle out the park. 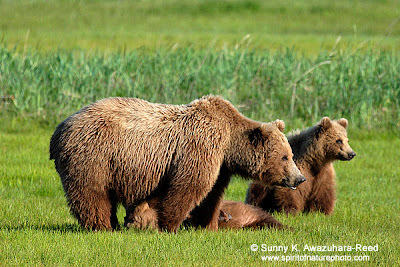 The afternoon of the 2nd day in Hallo Bay, Katmai National Park, 3 new people arrived with tons of camera equipment. Two of them were photographers from France; they paid extra money to have their own guide. They were on a 6 week project in Alaska. Another man was a retired bio chemist; now he is a bear enthusiast. He has been staying in Hallo Bay about a month every year for many years! Wow, it is very expensive to stay there for 3 nights, but a month, I have no idea how much it cost! He brought a high-end camera, a bazooka looking telephoto lens, and HDR video camera. Between morning and evening excursions, we had a few hours of relaxing time. However, we weren't allow to leave the Camp area by our self, so I just took a shower and hung out at the main galley. The main galley is a big canvas room with kitchen and dining area with cozy tables. I liked to hang out there and chat with other guests in the galley. Hallo Bay Wilderness is an environmental friendly operation with only 5 guest cabins. The guest cabins are also made of canvas with simple bedding, sink with a container of water, table and heater. The showers and bathroom are a separate building. The windmill generates all electricity for the camp. We were only allowed to eco-friendly soap and shampoos. 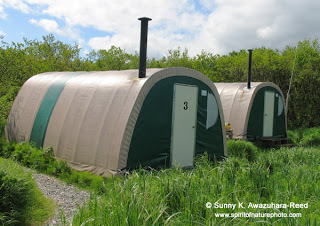 i am amazed with their environmental policies for the entire camp. In the remote wilderness, it was still luxurious. Since there were only 10 guests per night, everybody got know each other and become friends. i had a good conversation with a couple from Ireland. A boar showed up from the woods, far right. One of the bear families got nervous. The mother stopped eating, rose her head up and started huffing. She slowly moved away from the boar, toward to another family in front of us. Boars sometimes kill cubs so that he will be able to mate with the sow. Isn't it terrible? Anyway, the family moved close to another family. Another mother got very nervous for the family moving to them, and began huffing loudly. Then, she walking toward to us with her 2 cubs! They stopped 20 feet away from us, but still looked nervous at other family approaching. The boar came very close to the area where the French photographers were at. Their guide successfully shooed the boar away. However, the nervous bear family moved closer to the family that was 20 feet away from us. The family closer to us got very nervous and started moving closer toward us. They seemed to be coming straight toward us... Our guide Herb stood up and showed a flare, and told them, "no, no," but they were coming to us. I was frozen and hiding behind of Herb and my husband. Someone in our group; German guy, kept taking photos of the approaching bear family. I could only shoot one - a cub's face with bad exposure. The family was stopping and huffing for a while in front of us, and then finally passed about 5 feet away from us. it was too close! I was sweating! The guide, Herb joked, "Sorry guys, we can't get any closer than this." It was after 9 p.m and the bright sun was still above us. We repeated these kind of bear viewings the next day. Then, the following morning, the small plane picked us up on time and took us back to Homer. Viewing and photographing huge bears close by without fence was an exciting experience. I felt very special feeling toward those magnificent animals. The 2nd day in Hallo Bay was a beautiful sunny day. After having breakfast with the other guests, we were divided into two groups. Each group had its own guide. Following our guide, we walked along the beach, and then entered the dense woods. We walked on the trail, but there are some bear trails that cross the human trail. Bears can pop out behind the trees at any moment. The view was opened up in front of us; The scenery was breath-taking - tidal coves and snow covered mountains were the backdrop. And, there were bears down below!! Two bear families - each had 2 cubs! They were digging clams on the beach. We were looking at them from the hill at the edge of the woods for a while. One mother bear laid down on her back and began nursing! Her 2 cubs nursed on her for a while. That was a beautiful moment. 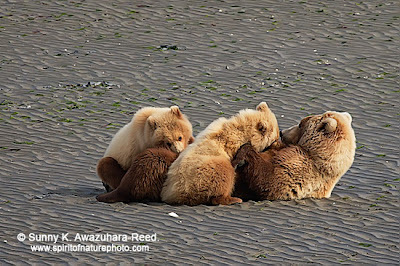 We walked down to the tidal flat and enjoyed seeing those 2 bear families from a far. 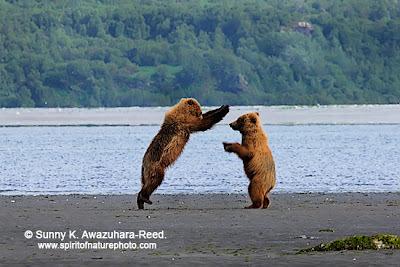 They were digging clams for a while, and the 2 cubs began play fighting... I still couldn't that it was a real experience out in the wilderness - it was like a being in a nature show. Then, the mother bear walked toward us gradually - followed by her 2 cubs. Looking with my telephoto lens, they got closer and closer... Actually, they were coming close to us. They were only 20 feet away; the mother bear stopped and sniffed the air. according to our guide, bears can recognize an individual by the smells like dogs can. Oh, my goodness, she was very close! I was about to back off, but the guide told me not to move. Bears may think I'm prey if I move quickly. The bear family walked by 10 feet in front of us. One cub curiously approached within 5 feet of us. Even a cub, he is bigger than me! The guide showed him a flare and calmly told the cub, "no, no..." My heart was beating hard, fortunately, the cub turned to the mom and passed in front of us. 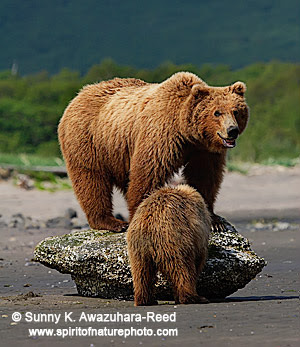 The mother bear stopped at a rock very close by, and licked at the little shells covering the rock. One of the cubs copied her. My finger was on the shutter button. She climbed on top of the rock, and sniffing the air for a while as she paused for the camera! It was a perfect shot! After the bear family left, a fox showed up on the beach. 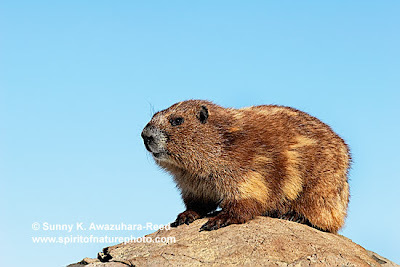 He was also digging clams just like a scene in the movie: "Grizzly Man." 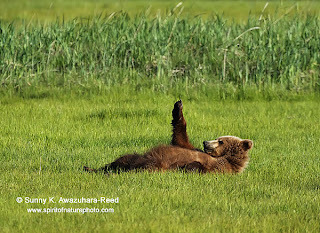 We already saw a lot in morning, but there were more bears at the meadow near the tidal flat. We explored the meadow at the evening. 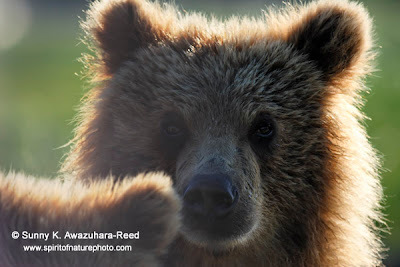 I went back to Alaska again... Photographing bears is one of my passions now. At this time, I stayed in Hallo Bay, located on the remote coast of Katmai National Park, on the Shelikof Strait. Getting to Hallo Bay was an adventure... 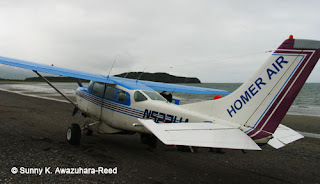 I flew in a small old Cessna from Homer that was delayed for many hours by the weather. The plane took off late in the afternoon, even though it was supposed to fly in the morning. On the plane, I flew close to the mountain tops, glaciers, and volcanoes. The plane landed on a sandy beach - no runway! The evening we arrived, there were 9 new arrivals including my husband and myself, a guide took us on an introductory walk to the beach. Since we were deep in the area with highest population of brown bears (grizzlies) in the world, we weren't allowed to wander around without a guide. Bears would even sometimes wander right by the Camp area! Bears might came out from anywhere! So, we always have to walk with a guide and stay together in a group. Bears don't attack a group of people. The Camp wants to keep the perfect safety record. 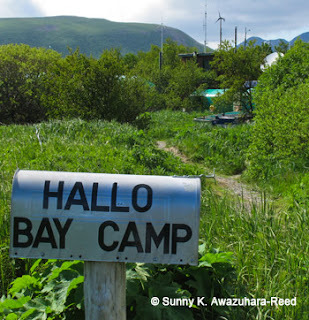 The coast was truly wilderness, Hallo Bay Bear Camp in the only bit of civilization in this remote bear habitat. If you ever heard about Timothy Treadwell (in the documentary movie "Grizzly Man"), he was camping by himself at the south of Hallo Bay for 13 summers among bears, until he and his girlfriend were killed and eaten by a bear in 2002. A woman working at the Hallo Bay Camp saw him a few times. "One day, he was wearing camouflage and had painted his face to black, then the next day, he was wearing a 3 piece suite in this wilderness, " she described. 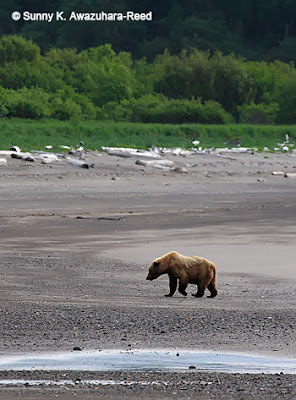 During our first walk, we walked along the beach, crossed a little stream, and looked at shells including razor clams which the bears had dug up and eaten during the low tides. Suddenly, a bear popped out from the bush ahead! 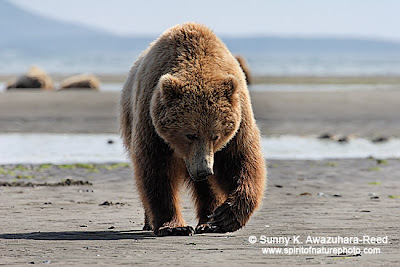 The bear wandered along the beach, then ate the grass for a short while, and then disappeared into the bush again. That was the highlight of the short walk. The next two days, I experienced many intimate bear encounters. This story will continue to my next blog. I hope you enjoyed my first blog.